I have been working for a few weeks to put together some posters for a small internal exhibition about Charles Harington, one of our past directors. I hope it might be of interest to a wider audience, so I have turned it into this blog post. A true biochemist. Charles Harington was one of the most distinguished biochemists of his generation. He was a classical organic chemist but with the outlook and approach of a biologist; a true biochemist. “He was able to absorb not only the knowledge but also the outlook of researchers in fields outside his own”. First publication. Harington’s first paper, published when he was aged 24, concerned the ship-worm. He spent a few months at the Marine Biological Association in Plymouth during 1921, looking at chemotaxis and enzymology of the shipworm. This was research undertaken on behalf of the Institution of Civil Engineers’ Sea-Action Committee, funded by the Scientific and Industrial Research Department (a government body). This committee was charged with investigating the deterioration of structures of timber, metal and concrete, exposed to the action of sea-water. George Barger was one of the scientists they commissioned to carry out the work and Harington worked with him on the project for ten years on and off. The committee’s final report was a 320-page tome published in 1935. 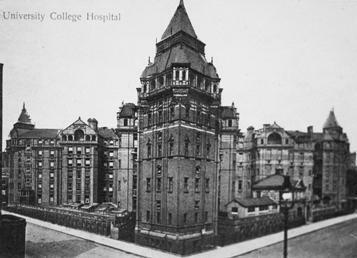 The old University College Hospital (Cruciform Building). Lectureship. In 1922 Harington was appointed as a Lecturer in Chemical Pathology at University College Hospital Medical School, helped by a strong recommendation from Barger. Obligingly, the School sent him off to the USA for a sabbatical. He worked first with Henry Dakin, a colleague of Barger’s, and then at the Rockefeller Institute for Medical Research in New York. Over the next 20 years he rose inexorably through the ranks, becoming a professor at the age of 34 and ending up as the head of the prestigious Graham research labs and head of department for all of pathology at UCH. Harington made his name through his work on the thyroid gland and its secretions. In 1926 and 1927 he published three papers, one with George Barger, in which he established the structure of L-thyroxine as the thyroid hormone. Besides being the first hormone to be chemically synthesized, Harington’s synthesis of thyroxine is still considered as a major tour-de-force of synthetic organic chemistry. These three papers are his most highly-cited publications. Many remained sceptical as to whether the harsh chemical procedures of synthesis in the laboratory gave useful insights about the formation of the hormone within the thyroid gland until, some years later, Harington demonstrated that two molecules of diiodo-L-tyrosine could spontaneously couple to give L-thyroxine under mild conditions. This coupling was later shown to occur within the large, unique iodinated protein of thyroglobulin present in thyroid cells in all vertebrates. a more distinguished chemist, with greater knowledge and experience, would never have tried the experiment. The recollection of this has remained with me all my life, and has pulled me up many times when I have felt inclined to discourage someone from doing an experiment which seemed unlikely to succeed. 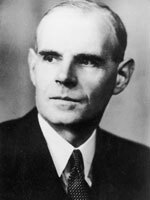 For his work on thyroid secretions Harington was nominated for a Nobel Prize six times between 1928 and 1953, but he was overlooked each time. His book The thyroid gland: its chemistry and physiology, published in 1933, deals with the chemistry of thyroid secretions, the physiology, pathology and clinical aspects of thyroid disease. It remained the classic work until Rosalind Pitt-Rivers and Jam Tata published their work on the topic, 26 years later. Harington said that his book “represents the attempt of a chemist to integrate the significant findings of biological sciences, together with those of chemistry, into a reasoned account of a subject which is, after all, of biological rather than of chemical interest”. Glutathione synthesis. Glutathione had been known since 1888 and was studied in the 1920s by F. Gowland Hopkins, who thought that it was a dipeptide composed of glutamate and cysteine. In 1935 Harington finally confirmed by chemical synthesis that the correct structure was a tripeptide. As with L-thyroxine, its synthesis was a major achievement. The stability of glutathione in solution latre helped to explain its biological activity as a reducing agent and anti-oxidant agent. Immunochemistry. Another of Harington’s major interests just before the last war was immunochemistry. He aimed to produce antibodies to biologically active substances, such as hormones or drugs, by introducing appropriate chemical groups into proteins that would then be used as antigens. He achieved some success, but the war prevented him from exploiting the idea fully. Almost a generation later the technique of tagging antigens with radioactive or chromogenic molecules was used in various research centres, including NIMR, to help clarify many problems of immunochemistry. Harington recruited the immunologist John Humphrey to NIMR in 1950, and he later set up NIMR’s first Immunology Division, thereby laying the groundwork for much subsequent success. Harington also encouraged the development of the Division of Biological Standards, setting the stage for its splitting off as the National Institute for Biological Standardisation and Control (NIBSC) in 1972. “the phenomena of immunity are fundamentally chemical in character, and … it is therefore through chemical and biochemical methods of attack that further advances in their elucidation are most likely to be achieved”. At the time when Harington was Director of NIMR the MRC was responsible directly to the Privy Council and was relatively unconstrained by bureaucracy. It was a time when both scientific research and research institutes were held in high esteem. He was a good administrator, quick to make decisions and painstaking in his attention to detail. Under his direction the Institute was an ideal place for researchers who wanted to devote all their energies to research rather than administration. He took pains to know all his staff, both senior and junior scientists. He would regularly dine in the canteen, sitting anywhere he could find a seat, and chatting with those around where he sat. “It was a pleasant and exciting place in which to work and most of the credit for this must be given to Harington”. Albert Neuberger, (Head of Biochemistry at NIMR, 1950-55). “Due to the increasingly important part played by physical methods, the new building had to be fundamentally revised to provide facilities such as electron microscopy, electrophoresis, high-speed centrifugation, ultrasonics, radioisotopes, and mass spectrometry”. Growth and reputation. When Harington started as Director there were 45 members of scientific staff, in nine divisions. This expanded to 80 staff when NIMR moved to Mill Hill. On his retirement there were 145 scientific staff, in 14 divisions plus two special laboratories. Because of the Institute’s international recognition there were also many more workers from overseas. The quality of the senior staff appointments made by the director are more important than the addition of new divisions and laboratories in judging the achievements of a large research establishment such as the NIMR. Harington brought to the institute exeptional scientists such as Archer Martin, Rodney Porter, John Cornforth (all future Nobel Laureates), Alick Isaacs (the discoverer of interferon) and others who went on to play decisive roles elsewhere in research establishments and universities such as Albert Neuberger, James Lovelock, Martin Pollock and Tony James. “the Institute has maintained its position of distinction and has continued to train a succession of leaders in research. …this continued success is due to the personal achievements of Sir Charles Harington. The breadth of his knowledge has enabled him to promote collaborative research within the Institute … and the personal confidence that he has won from his staff has been an essential factor in maintaining the Institute as a scientific community”. Over the years Harington thought and wrote a good deal about the purpose of a research institute, the relation between science and medicine, and the best way to manage research. When he had worked at the Rockefeller Institute he had been disappointed by the relative lack of collaboration between the different departments there, and the resulting tensions. He was keen to prevent a similar situation from developing at NIMR and he strongly supported NIMR ‘s tradition of encouraging co-operation between scientists working in different departments. A few quotes from his writings on the subject are presented here. The organisation of divisions within a research institute should be as flexible as possible, and the very existence of the divisions and of the resultant general groupings of staff should be regarded as no more than an administrative convenience. Pre-eminent importance is attached to the principle of flexibility and avoidance of departmentalization. 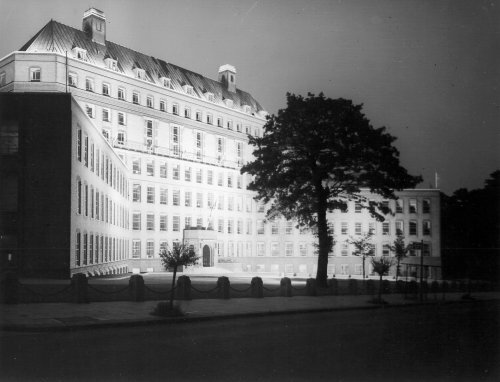 Talk at the National Physical Laboratory (1956): Staff groupings and the flow of authority. The preservation of the maximum degree of academic freedom … is of vital importance to the scientific work of a research institute. Talk at the National Physical Laboratory (1956). All basic research is a pioneering effort and the man who takes it up is embarking on an adventure. Talk at the National Physical Laboratory (1956). Communicating science. Harington believed it was very important that scientists were able to communicate effectively the content and significance of their research, within and outside the Institute. He took great pains to critically examine and edit all publications by NIMR staff, especially those of the more junior members of staff. His criticisms were never negative but always intended to help the younger people with their careers. Biochemical Journal editor. He became joint editor of the Biochemical Journal in 1929 and senior editor in 1937, serving until the end of 1942. He wrote clear and concise English, disliking pomposity and unnecessary scientific jargon. He had an important influence on the journal during an important period of its development. In appreciation of his services, he was granted honorary membership of the Biochemical Society in 1961.
International Union of Biochemistry. In 1947 the Biochemical Society began to explore the possibility of setting up an International Union of Biochemistry and Harington took a leading part in the discussions. The first International Congress of Biochemistry was held at Cambridge in 1949, and set up a multinational committee with Harington as Chairman. Six years later the IUB was officially recognized, and Harington must be considered as one of its founders. Scientific foundations of endocrinology. The Society for Endocrinology was established in 1946. Harington was invited to give the inaugural address at the first Annual General Meeting of the Society. “I regard myself as a biochemist and do not claim to the status of endocrinologist. Until recently biochemistry itself was a poor relation of physiology. Endocrinology has now in its turn earned independent scientific status. No endocrinologist can hope to know … all the sciences on which his own work rests, but he must know his way about if he is to find his way home; he must have a lively appreciation of the contributions which different techniques can make to his own particular line of effort and be ready to receive inspiration from whatever quarter it may come, whether from … clinical observations or from fundamental studies of biologists and biochemists”. Medical Research Council. After retiring from NIMR he continued as a Consultant Adviser to the Secretary of the MRC for a further 5 years, up to 1967, serving as Second Secretary for some of that time. He helped to establish the MRC ‘s new Biological Research Board and was also closely involved in planning the Clinical Research Centre at Northwick Park. Sir Charles Harington’s retirement from the directorship of NIMR was commemorated at a ceremony on 14 November 1962. 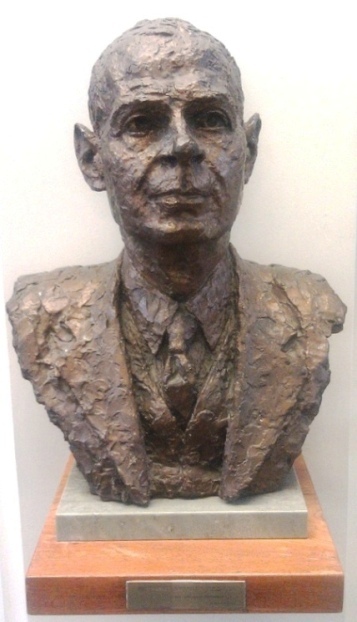 Lord Shawcross, chairman of the MRC, presented him with a bust by the sculptor Benno Schotz. Sir Harold Himsworth, secretary of the Council, spoke about Sir Charles’s distinguished contributions to medical research. The ceremony was attended by many of those who had been associated in one way or another with Sir Charles and had subscribed to the presentation fund. This statue now resides in the Library. I walk past it every day and am therefore very aware of Sir Charles Harington and his contribution to NIMR. I am told that the left profile and right profile have different expressions, but the difference is ever so subtle. On one side he has a stern forbidding look, on the other side there is just a suggestion, a tiny glimmer, of a smile. As ever, the Royal Society Biographical Memoir on Harington, written by Harold Himsworth and Rosalind Pitt-Rivers, is a mine of information about his life and work. The obituary by Albert Neuberger in the Biochemical Journal, the journal with which Harington was so closely associated, has a good account too. This account of the founding of the Society for Endocrinology was also useful. Harington’s own articles about NIMR, published in 1949 and 1950 along with Landsborough Thomson’s history of the MRC, Half a Century of Medical Research were also useful. I also used extracts from Harington’s various writings about research. Thanks too to Jam Tata and Bob Cox for numerous discussions about Charles Harington, and for reading and correcting an earlier draft. This entry was posted in History, Research Councils, Research management. Bookmark the permalink.